The Little Round Table: Fiesta Children Love Red! jump over to It's A Very Cherry World to check out this week's RED posts! Pearl Gray, and Scarlet Post 86 Fiesta, Black Kenilworth carafe, Cityscape flatware. Black and white just make the RED pop! That tablecloth is so festive, and the plates and glasses match so perfectly! What's for dinner?! Ooooh! Nice reds (and blacks and the rest)! Oh my gosh, I am lovin' all your Fiestaware! I love your red and black, so pretty together with the white accent! This is so colorful and pretty! I looove it! Now I am really loving this table setting. It is just perfect for a great Mexican Dinner. So Festive. Any meal would taste better on this setting. I have always loved that color combo. 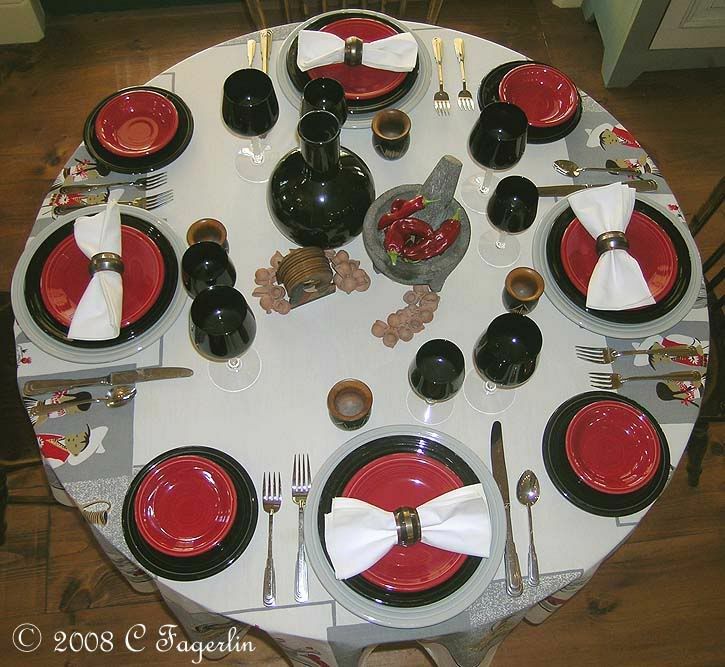 I love red and black together and you have done it beautifully with this great tablescape! I am just amazed at your imagination, and all the tablescapes that you come up with! What a fun tablecloth! What's for dinner tacos or fajitas? Your table setting is fun and festive no matter what you serve! Please stop back again when you have a chance to check out additional tablescapes. Wow! How wonderfully retro. Love it! I thought I had quite the collection of fiesta ware, but I ain't got nuthin on you! You do some AMAZING tablescapes with yours, and I am loving them! The tablecloth just makes this one! Thanks Melody and Laura, I appreciate your nice comments and am so glad you stopped by. 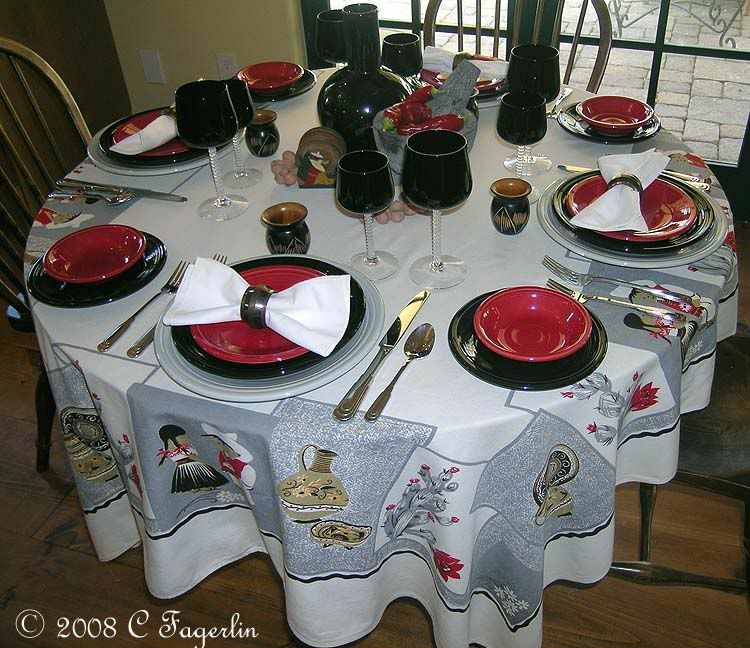 Check out another tablescape for Foodie Friday and MORE dishes for Show and Tell Friday.